AutoDrive has received funding within the Electronic Components and Systems for European Leadership Joint Undertaking (ECSEL JU) in collaboration with the European Union's H2020 Framework Programme (H2020/2014-2020) and National Authorities, under grant agreement n° 737469. 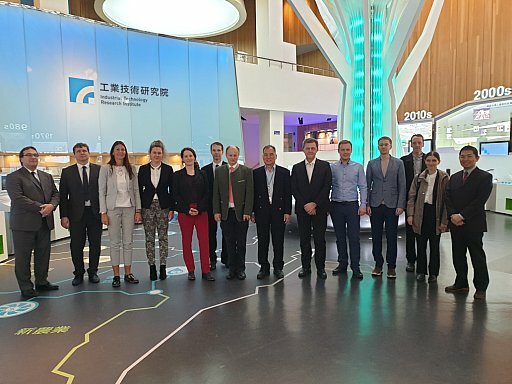 AutoDrive delegation visited Taipei, Taiwan with the aim of meeting existing and potential project partners to discuss the best ways to continue, promote and develop cooperation between the European countries and Taiwan, as well as to generate new ideas and procedures for future projects. During the first day of the meetings AutoDrive partners gathered at Infineon Taiwan premises where they had a fruitful discussion about new ideas and approaches regarding smart driving and machine self- learning. The covered topics were the following: how to make a car think and behave like a human driver, capable of managing extremely difficult weather conditions, and basing its decisions on experience, context, and foreseen scenarios. Partners considered possibilities for creating a vehicle which will able to proceed with cognitive decision-making. During day two AutoDrive delegation had a workshop in Chung-Hsin in Industrial Technology Research Institute (ITRI). The meeting started with a welcome speech by ITRI Director Mr. Chilung. His speech was accompanied by a video about ITRI’s research center capabilities in 3 main research areas: Smart living, Quality health, and Sustainable environment. Afterwards, the meeting was continued with a seminar about AI Infrastructure and applications, followed by discussions between the AutoDrive team and ITRI regarding AI for the digitalization of industry. Moreover, ITRI’s representative Mr. Welkin Lin gave an inspiring presentation about battery systems with AI gene – RAIBA (Reconfigurable Array of Inhomogeneous/Inexpensive Batteries Architecture). During the third day of meetins, AutoDrive team held a meeting at the Ministry of Economic Affairs of Taiwan. Representatives of various organizations such as the Ministry of Economic Affairs, Taiwan Institute of Economic Research, Delta Electronics Capital, ITRI, and other organizations were participating. This meeting was opened with AutoDrive coordinator’s inspiring speech about already successfully implemented former project 3Ccar, as well as the ongoing project AutoDrive and its outcomes and continuation possibilities. The meeting was followed by Shou-Hung and Welkin (ITRIs’ representatives) presentation about the Horizon 2020 projects 3Ccar, AutoDrive, and AI4DI as examples of an excellent process for open innovation and vision realization. Example of green and connected Taiwan’s transportation and mobility systems as a great hub for key enabling technologies and test bed for future collaborative work with Europe was described. After interesting and thought-provoking presentations, all the participants of the meeting continued to discuss key topics regarding previously mentioned ongoing and future projects. The official part of the meeting was completed, and on this day the AutoDrive partners made a cultural visit to Sun Moon Lake where they had a planned program with bicycles and boat around the Lake. After serene tours with boat and bicycles, partners were taken to Mintag power plant with reservoir and energy storage power station. At present, it consists of five units including Mingtan Pumping Storage, Shuili, Giant Worker, Turbid Water, and Beishan. It is currently the largest hydropower plant in Taiwan. Among them, the pumping unit was completed in 1993 and became one of the largest pumping and water power plants in the world at that time. Batteries2020 - optimising EV batteries. SmartCity Malaga - the first real smart grid pilot project.